Part of Glock's Silver SlimLine series, the New G43X combines the short and slim dimensions of the G43 to the extended frame of the G48. Makes for a perfectly balanced fit for all hand sizes with a magazine capacity of 10 rounds. 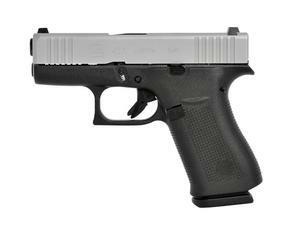 Features an nPVD silver finished slide and front serrations.